United Launch Alliance (ULA) celebrated an incredible milestone today, Oct. 2, with the successful launch of the firms 100th mission on an Atlas V rocket carrying Mexico’s next generation Morelos-3 satellite to provide advanced telecommunications for education and health programs for rural communities and secure communications for Mexican national security needs. The spectacular predawn liftoff finally took place at 6:28 a.m. EDT from Space Launch Complex 41 on Cape Canaveral Air Force Station, Florida – after nearly being derailed by a literally last second unexpected delay caused when an errant boat suddenly entered the safety exclusion zone, forcing a temporary postponement to the very end of the launch window. 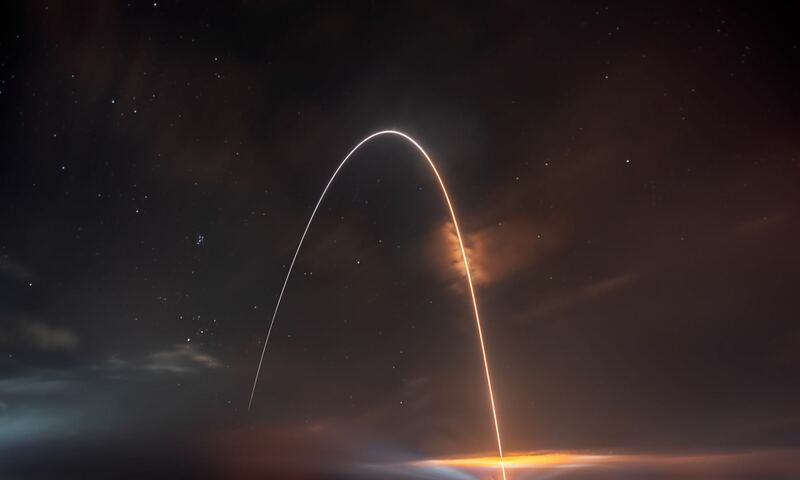 The Atlas V blastoff lit up the darkened skies, thrilling spectators all around the Florida Space Coast, and successfully delivered Morelos-3 to its desired geosynchronous transfer orbit of 2588 x 19323 nautical miles. ULA President and CEO Tory Bruno was personally on hand for ULA’s milestone 100th launch since the company was formed in late 2006. It was also the 57th Atlas V launch since the vehicle’s inaugural mission in 2002. “The launch was beautiful,” Bruno told reporters at a post launch media briefing. Friday’s blastoff came in between a pair of threatening weather events – as the Category 4 Hurricane Joaquin was thrashing The Bahamas nearby with 130 mph winds and rains and a nor’easter was drenching a wide swath of the US eastern seaboard with torrential rains from the Carolina’s to New England – see my report here. Morelos-3 counts as the second of two communications satellites that comprise the Mexsat communications satellite system for the Mexican government’s Ministry of Communications and Transportation. The Morelos-3 launch contract was procured for Mexico by Lockheed Martin Commercial Launch Services and markets the Atlas V to commercial satellite customers worldwide. 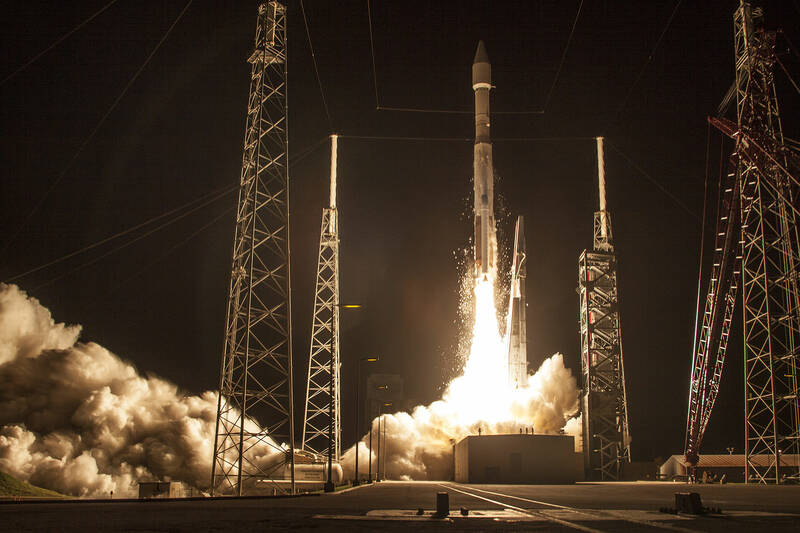 “The quality and reliability of the Atlas V is unparalleled, and today it delivered on a critical step toward bringing next-generation mobile telecommunications services to Mexico,” said Steve Skladanek, president of Lockheed Martin Commercial Launch Services. So far everything is right on the money for the Boeing-built Morelos-3 satellite. “The satellite, named Morelos-3, is transmitting initial on-orbit signals as it makes its way to its final orbital location within Mexico’s new Mexsat system,” Boeing reported. This Atlas V rocket was launched in its V 421 configuration vehicle for only the fifth time. The rocket includes a 4-meter diameter payload fairing and two Aerojet Rocketdyne solid rocket motors attached to the Atlas booster. The Atlas booster for this mission was powered by the RD AMROSS RD-180 engine and the Centaur upper stage was powered by the Aerojet Rocketdyne RL10C-1 engine. ULA is maintaining its steady pace of on time launches. The last launch of a ULA Atlas V from Cape Canaveral took place barely a month ago on Sept. 2 carrying the US Navy’s MUOS-4 military tactical communication satellite to orbit. The next Atlas V will launch on Oct. 8 with a secret spy satellite for the National Reconnaissance Office (NRO), from Vandenberg Air Force Base, Calif.
ULA is also developing the Vulcan rocket taht will be much lower in cost and much more competitive in price to meet the challenge from SpaceX- detailed in my exclusive interview with ULA VP George Sowers – here. Previous PostPrevious Is There a Kraken in Kraken Mare? What Kind of Life Would We Find on Titan?